This look, for some reason, is one of my favorites I have posted. I am not sure if it's because I am sporting a graphic tee of one of the greatest band of all-time, Journey or because I took a risk. Risk meaning, I am wearing glasses (not counting sunnies) for the very first time ever on my blog. I don't think this outfit would have been complete without them. And can I let you in on a little secret? These are not prescription glasses. They are a $6.00 pair from Forever 21. I grabbed them a few weeks back thinking they would make a fun dress up addition for my kids. What do you know? Looks like I am getting more use out of them than my girls. Maybe deep down I bought them for me. Anyhow, I wanted to style a look in honor of back to school. Lots of kiddos have already hopped back on the bus, but we don't start until Monday. We have been consumed with getting prepared for the school bell and thought it would be fitting to show you my version of going back to school, ahem, old school. When I received this Grace B skirt (now 30% off until Monday, August 26th) in the mail, I immediately thought of "school girl" because of the eyelet detail, style and fit. I wanted to express, in real life, what I would wear if I were a student again and for a hot minute remember what the exhilarating feeling of starting a new school year felt like. So, what would any adult do trying to relive their days in the classroom? Well, they would throw on an old school band t-shirt, slip into some oxfords, find a bold-structured blazer, grab an oversized "book" bag, incorporate some eyelet (for innocence purposes) and sport a pair of tortoise print glasses. Oh, and of course add a mature statement necklace to make one's self feel a little more grown up. If you were headed back to school, what would you wear on the first day? Are you more the, I don't care, I don't want to go back type? Or were you the one that dressed to impress and picked out your outfits the night before? I am not admitting to either, but I bet you can guess which category I fell under. I am so excited to share another style blogger with you today. Rebecca with Mommy in Heels is just that, a mom wearing her best heels one day at a time. If you are looking for both style inspiration, motherhood advice or life's journey, Rebecca is your girl. I love how she sprinkles both fashion and real life into her posts. She also isn't scared to get pretty raw and discuss her battle with self image, quite possibly our downfall as women. I highly recommend you read it. She also has a superb knack for taking a celebrity style and making it her own. Honestly, I think she does it better most of the time. And every now and again, she will share with all of us some of her fab beauty finds, on a budget. That's what I am talking about. All in all, Mommy in Heels and I are typically on the same page when it comes to style, don't sacrifice it once you become a mom. You know, women with kids can still rock the trends and stay confident while doing so. Check out how Rebecca knocked it out of the park with this look. I am happy that I could help all of you discover another blog, Mommy in Heels, to add to your roll. Today, Rebecca is giving away a $25 Target gift card to one lucky reader. 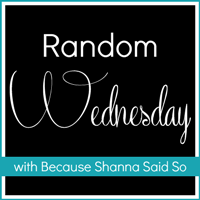 Make sure to stop by her blog to say hello, thank you and nice to meet ya! This is such a fun look Shanna!! You have styled it impeccably - and I love that blazer! Such a gorgeous color. Thank you for hosting the link up, I always love joining in! Shanna - can you be any cuter?! Love this outfit. I have been wanting to buy some brown oxfords. They seem to be popping up everywhere and it's been on my mind. I love this! The skirt is so cute and looks great with the bold blazer. And you look good in glasses! How many ways do I love this outfit? The glasses, the oxfords, JOURNEY! :) So cute! You better WORK this outfit. You totally nailed it. This is exactly what I would wear to my first day of school :-) I'm all kinds of obsessed with that blazer. Love this outfit! I have been looking for cute ways to wear a print T! I love your outfit today Shanna - so fun! Oxfords are my favorite in the fall, can't wait to break out my pair! You are so stinkin' adorable! I love the glasses on you, and I'm totally smitten with your oxfords! OMG...how cute are those glasses on you! I read your post (or tweet?) about running around looking for the right size folder. OH man. Are schools that specific? Yikes. I'm in for trouble! Ah Journey - I remember listening to them as a small child. My dad loved them! This is a fun look! You look adorable in your glasses! I really love that bright red blazer–it's such a statement piece and the color looks fabulous on you! You are looking so fantastic in your school girl look Shanna....more power to your girls on their back to school moment!!! Love the skirt, but I ADORE the t-shirt. Journey for life! My goodness you look absolutely adorable! Um, I was totally the, pick out my outfits the night before type.. but I'm sure you could have guessed that. But, when I think back, I don't think I was nearly as cute or trendy as you in this picture! i adore this look Shanna!! you look so so good. i love the fake glasses. yes! YES! Love Journey! And I love how you made the tee into a whole back to school look! Simple and sweet - I love this look! And your handbag is stunning! Sometimes I wish my eyeglasses were fake, but I've realized that I am who I am and my glasses are definitely an accessory :) Yours look so cute on you! Um. You rock. Graphic tees with skirts are AMAZING. I love this geek chic look on you. Such a fashionable mom! Love this look! I love Gracie B too! This outfit is too cute. Love that tee and Journey!! Okay, you look freaking adorableeee. Seriously, love this look! I posted a "school girl- inspired" look last week that reminds me of this, with oxfords :) I was most definitely ALWAYS the type to pick out my outfit in advance and have it all layed out the night before. Every. Night. Not just the first day of school. Stop it - you're a mama and this cute? On my blogroll pronto, thank you very much! LOVE this outfit!!! It's one of my favorites of yours!! Get out of here with your cute, back-to-school self! Love the glasses! And Journey! I love these glasses Shan!!! You look hot, and this could be one of my fav looks on you as well. It really shows your personality! love you! Super cute look! Love the color combo between the red blazer, cognac bag, and grey skirt--- and the tee keeps it fun! Very cute, you are right, the glasses do add to it! I absolutely love this, yay for back to school! I actually am going back to school on Monday *thumbs down* but since I'll be rushing to class after work, I'll probably still be in my suit! Just amazing!! I want a red blazer for fall! !Hope you are having a wonderful day! I love this look with the glasses! I never thought I'd wear fashion glasses either until I started my blog. But it's fun sometimes! Love the tee! Faithfully is one of my favorite songs of all time... so classic! Boyce Avenue has a great acoustic cover of it on You Tube. Have a wonderful day! You nailed the going back to school look. Definitely the coolest kid at school lol. I got a red blazer & heeled oxfords you totally inspired me!pinning this! LOOOVE this outfit! So freaking cute, love the way you pulled it off! That red blazer is popping! Love it. LOVE it! 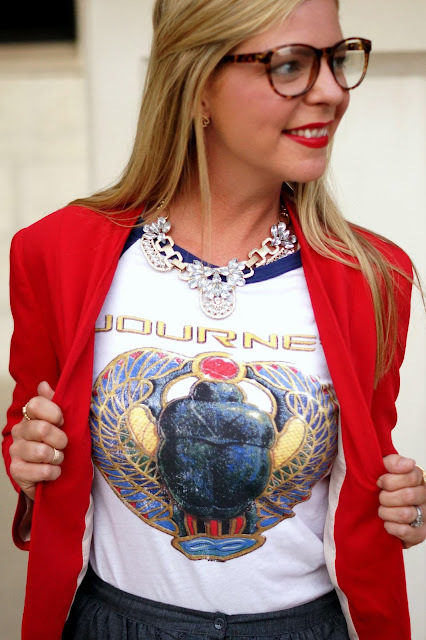 The necklace kind of mimics the Journey logo design on the shirt. The red blazer is classic, and you can't get more comfy than oxfords. Lovely!